Simple Blade Change – Quick acting locks for the spindle and a large outlet in the blade guard simplifies blade replacement . 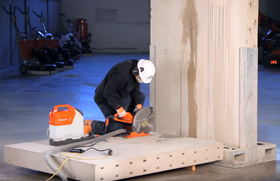 “Pulling” Rotation – The blade on all our electric cutters rotates forward, cutting into the material efficiently, minimising the risk of sticking and kickbacks. 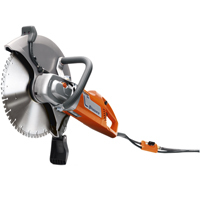 Perfect for Indoor Use – A powerful electric cutter for both indoor and outdoor use. Elgard – The advanced electronic overload protection varies the rotation speed to warn of approaching overload. Electronic Softstart – Provides starting with normal, slow acting fuses.